The Russian government and local authorities are seeking to support airlines by providing subsidies for flights to remote parts of the country. The underdeveloped road infrastructure in Russia's far north, Siberia and the Far East in some cases makes air travel the only option. Russian designers are now developing new planes for this purpose, giving airlines a wider choice of short-haul aircraft. The regional and local air travel market in Russia is on the rise. Thanks to federal and regional subsidies, airlines have now been able to revive some earlier abandoned routes. In 2014, support from the state has helped to carry some 1.5 million passengers, open over 80 new regional and interregional routes, and purchase new aircraft. However, the measures taken so far have not been enough to fully address the task of restoring a network of routes. Previously, airlines' fleets consisted of simple, undemanding aircraft, mainly those made in the Soviet Union. These were fit for operating in difficult weather conditions, taking off from unpaved and snow-covered airfields, and even water. Now, having exhausted their service life, most of those aircraft have been decommissioned. While in the European part of Russia and on some routes beyond the Urals, European-made ATR-42 and ATR-72 aircraft are being used quite successfully, in the Russian Far East there are still very few foreign-made planes. One of the most pressing problems is that of replacing the legendary An-2, lovingly nicknamed ‘Annushka’. The aircraft possessed some quite unique characteristics: It could take off from tiny airfields, could transport people and cargoes and could also be used to spray crops. The remaining fleet of these aircraft is very small: Mass production in the USSR stopped in 1971, with the last aircraft manufactured in Poland 12 years ago. So these legendary biplanes are gradually retiring. Yet it would be wrong to claim that the veteran Russian aircraft has no equivalents at all: the United States’ Cessna Caravan has good characteristics but in Russia it has been certified to carry no more than nine passengers (though there is room enough for up to 14 seats). As a result, airlines have to "transport air". Furthermore, this aircraft is not quite as good at taking off from unpaved airfields as the An-2. Canada's twin-engined Twin Otter is an internationally recognized utility aircraft, however it is very expensive in Russia and airlines find it hard to recuperate its cost on local routes. At the same time, Russian designers and engineers have come up with a range of aircraft models that could be used on local and regional routes. In the near future, the twin-engined Rysachok, created by the Tekhnoavia company, is due to start tests. Its production is expected to be based in Samara. This 16-passenger STOL (Short Takeoff and Landing, including from unpaved airfields) aircraft is cost-effective and reasonably priced. However, at the moment this aircraft is fitted with Canadian engines, which makes it more expensive - although Rysachok designers insist that they can adjust the designs to make the aircraft run on domestically manufactured engines. 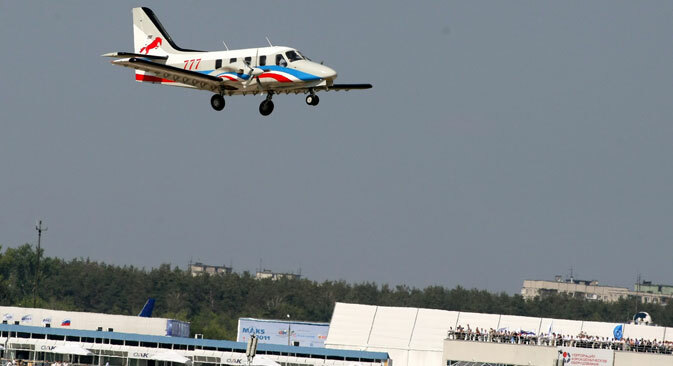 One more project that aircraft manufacturers in Samara have high hopes for is the Ilyushin Il-144, which is capable of carrying 64 passengers. Previously these Russian-designed aircraft were made in Tashkent, however two years ago the plant there was virtually shut down. With personal support from Russian Deputy Prime Minister Dmitry Rogozin, efforts are now under way to resume the production of Il-144s at the Aviakor plant. There are a number of factors that make it more sensible for Russia to manufacture aircraft for its needs independently. Country-specific factors need to be taken into account too: the climate and the state of the airfield network. The nearly 20-percent drop in the value of the ruble against the leading world currencies over the past 12 months makes it very hard for Russian airlines, whose sales come in rubles, to purchase U.S. or European aircraft. On the other hand, domestically manufactured aircraft get a chance to have a more attractive price on the world market. New opportunities are opening up for Russian aircraft manufacturers. President Vladimir Putin and government officials insist on state support for regional air travel. Russian airlines, which for a long time were insolvent, will soon be able to afford new aircraft, giving a boost to the domestic aircraft market. Additionally, state support for the domestic aircraft-manufacturing sector will make it possible to launch the production of new aircraft. Oleg Panteleyev is the head of the Russian analytical agency Aviaport, specializing in the collection, processing and distribution of business information about the aviation industry.